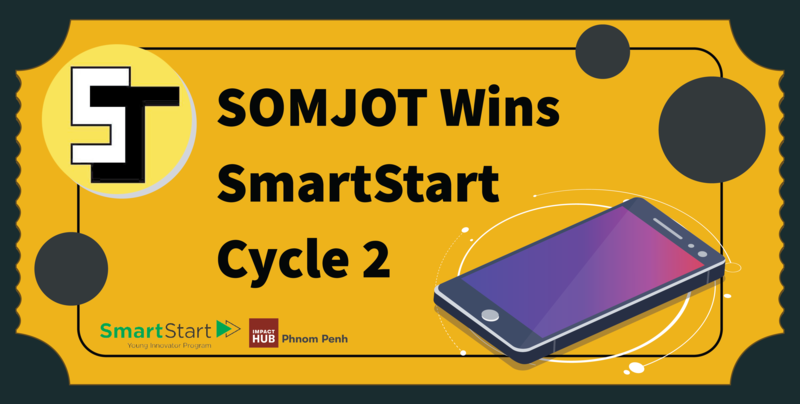 SomJot, a mobile application transforming parking in Phnom Penh, was selected as the winner of the SmartStart Young Innovator Program Cycle 2 and was awarded a trip to Singapore to visit tech giants like Google, Microsoft, and Facebook. Four other teams presented fantastic pitches at the Grand Finals at Impact Hub Phnom Penh, they were; Homex, a mobile application that connects users with household needs to reliable technicians; Haystome, a digital platform that connects tourists with local artists for a truly authentic experience; Malis, a digital solution facilitating appointments at beauty salons and Tos Rean, an online platform matching tutors and students. Thomas Hundt, CEO of Smart Axiata and a judge of the competition, emphasised on the difficulty the judges faced in coming up with a decision. The event concluded cycle 2 of SmartStart, a nine-month long program by Smart Axiata and Impact Hub Phnom Penh, endorsed by Ministry of Posts and Telecommunications and Ministry of Education, Youth and Sport, aims at enabling promising Cambodian university students to launch their digital business ideas. The teams that presented had received $4,000 in startup funding and a six-month incubation program from Impact Hub since June of 2018. “Although we had to face many challenges in the last few months, we were grateful to have experienced mentors, Impact Hub and Smart, who guided us till we finally launched the beta version of our application. We look forward to build on this success as our digital product and service gains traction in Cambodia,” said Ms Ny Chanpichmean from team SomJot. Mélanie Mossard, Impact Hub Phnom Penh’s Director of Venture Support, praised the commitment of all the teams throughout the whole program.